Lee Cooper watches launched a partnership with Arıkan Time in 2017. 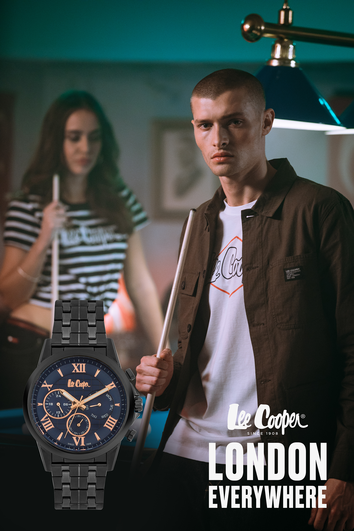 Lee Cooper watches are designed to complement the current iconic designs of the brand, as well as reflect its 100-year legacy of creating fashion. Up-to-the minute in terms of trends and technology, Lee Cooper watches are renowned for their high quality and for being extremely price competitive in the watch market. New models will be launched alongside a strong focus on sharpening the brand’s identity even further. A global life style brand is sold in over 100 countries with 5.3 million social media fans. Lee Cooper watches are renowned for their high quality and for being extremely price competitive in the watch market. Join us! Affordable Quality! Lee Cooper watches are renowned for their high quality and for being extremely price competitive in the watch market. QUANTUM WATCHES - HUNTER: The Giant! Hunter's exceptional size is a big challenge as its impression. Highlighted by touches of hi-tech details and innovations. Complication design features gives it’s own charm. Power means being able to rule time.Make your choice and take the first step towards self-realization. In the endless battle between the hour hand and the minute hand; Power is always in your hands with Powertech! QUANTUM WATCHES - ADRENALINE COLLECTION! Can you feel it? Your heart is beating faster already. Get moving with Adrenaline, multiply your energy. Catch the rhythm of life. WAINER-Swiss Craftmanship with affordable prices. Wainer is a new generation brand which reflects the enchanting harmony and innovation in every detail. Wainer offers sophisticated Swiss watchmaking craftmanship at affordable price.